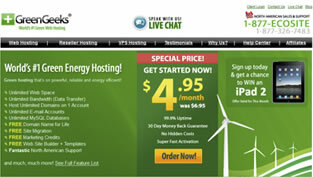 GreenGeeks has been a leading green hosting company for the past several years. Powered by certified wind energy credits, they provide a reliable hosting option with emphasis on minimizing their environmental impact. Their concern for the environment and their energy efficient services are a welcome addition to their solid hosting options. GreenGeeks offers their “EcoSite” hosting with all the unlimiteds that would be expected from any top tier web hosting company. They also offer solutions for customers who need reseller hosting or VPS hosting. These options are also environmentally friendly solutions. At a price point competitive to most other shared hosting companies, they are a great green alternative to consider when searching for a provider. Greengeeks offers 24/7 North American based support via toll free phone, live chat, and e-mail ticket system. Also included is an online knowledge base with frequently asked questions as well as video tutorials. Their support is generally helpful and knowledgeable, and wait times were usually short, although can be extended during peak hours. Many hosting companies are just getting into the idea of going green or offering green alternatives. The team at GreenGeeks has emphasized the use of green energy from the start. Since their conception, they have made green energy a cornerstone of their service. Their mission is to be able to provide environmentally conscious hosting at an afordable price, something they are certainly achieving. GreenGeeks offers the industry leading cPanel control panel. It’s large library of features and user friendly interface makes it the obvious choice for any hosting company to offer it’s clients. It is an asset for any customer to be able to efficiently and effectively manage all aspects of their hosting account.